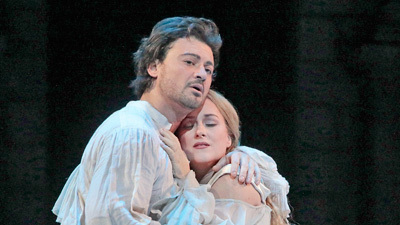 Legendary tenor Alfredo Kraus as Roméo brings flawless vocalism, elegance, and consummate style to Gounod’s romantic take on the world’s most famous love story. Cecilia Gasdia is an innocent yet alluring Juliette, and Met stalwart Paul Plishka sings the sympathetic Frère Laurent with dignity and charisma. Plácido Domingo, a celebrated Roméo himself, conducts.